Hello! 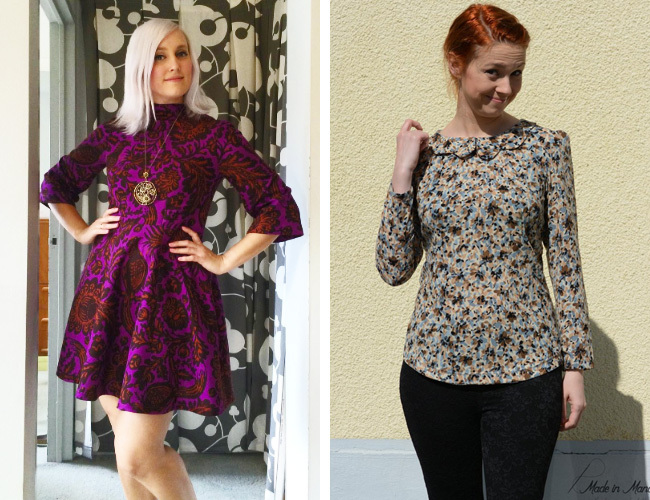 Lexy here, with another roundup of what you've been sewing over the past few months. We've been totally spoiled for choice after Me Made May, so here's a selection of some of our faves! 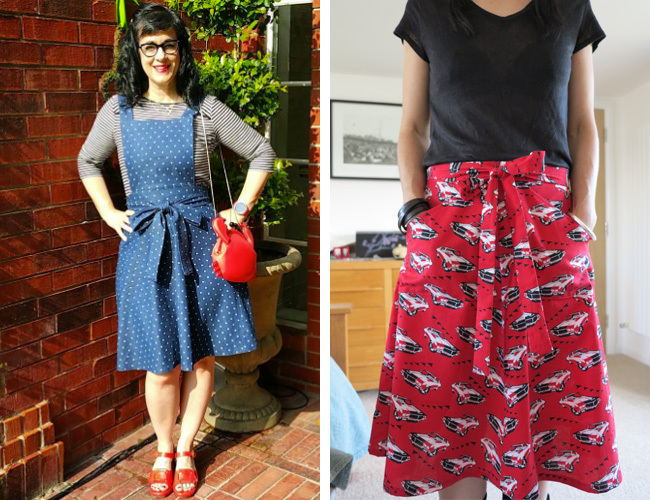 We released a new sewing pattern this month – hooray! The Marigold sewing pattern is a choice of jumpsuit or trousers, and is perfect for summer. Amy has made some GORGEOUS bee print Marigold trousers, which we are all coveting. 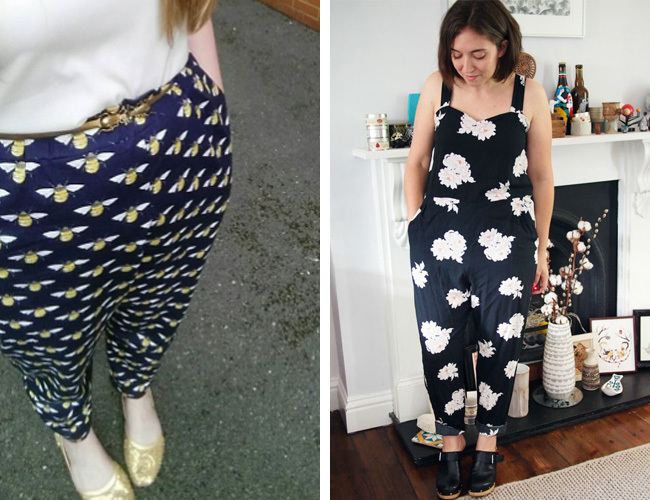 Katie very kindly tested the Marigold jumpsuit pattern before it was released, and decided to take out the elastic at the waistband to suit her personal style. 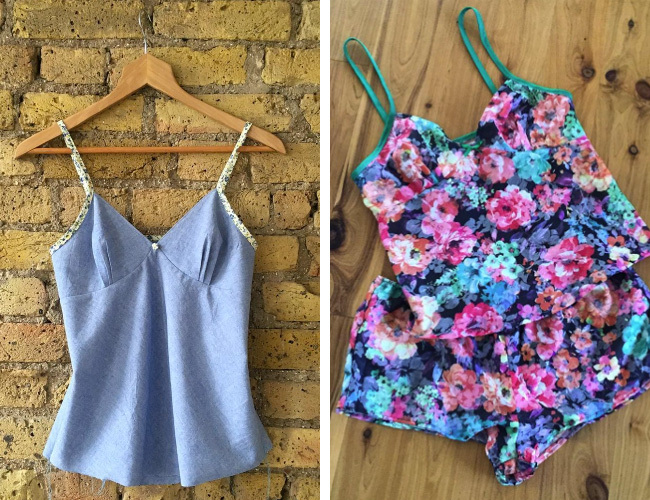 We think it looks lovely, and the perfect thing to dress up or down this summer. 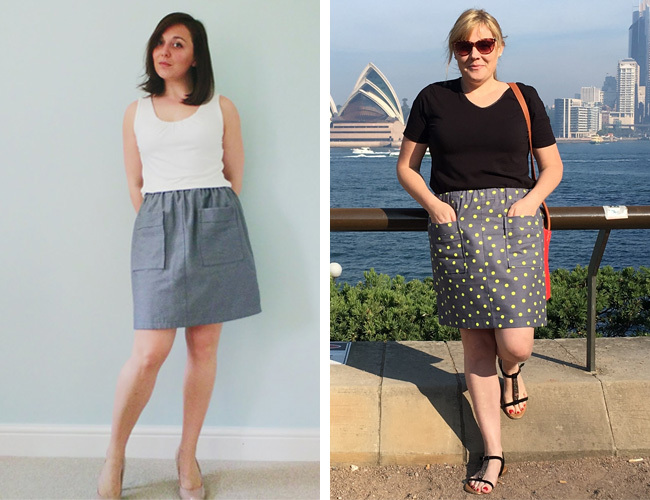 Laura made her beautiful Dominique skirt after completing our Learn to Sew Skirts online workshop, and looks super chic in it. Angela sent us this photo of her wearing her Dominique on holiday. It looks perfect in sunny Sydney! Sarah’s lovely chambray Bettine has got us all inspired to make the same. 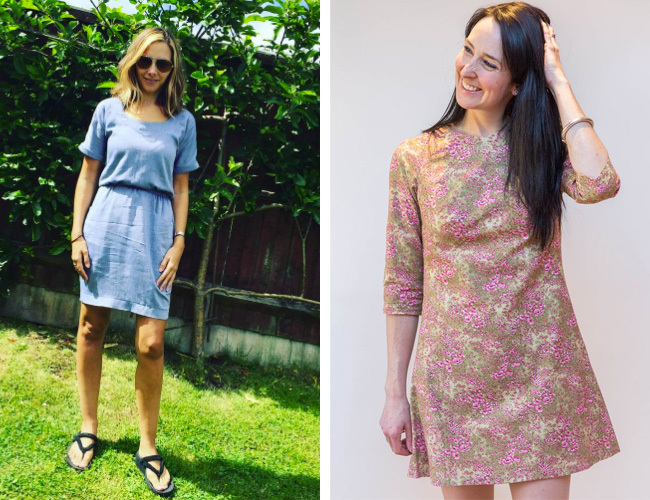 It’s the perfect throw-on outfit for the warmer weather, and is super flattering and easy to wear – and it’s one of our easiest patterns! Laura’s fresh Francoise dress looks stylish and flattering. The three quarter length sleeves make it ideal for cooler evening, whilst the above the knee hemline keeps it playful and fun. We like! This super skilled sewist is Emily, our former intern (hello, Emily!). We love the creative changes Emily has made to her Bettine dress, by making the skirt into a wrap front and adding a belt, and this colourful Arielle skirt really caught our eye! Head over to her blog for more pics and beautiful makes. This is something that regularly happens here at Tilly Towers - turning up to work in the same handmade outfit!! (At the moment, it’s Marigold. Playsuits for all!) June and her colleague both obviously have incredible taste, as evidenced by their love of striped dresses. June’s green Coco dress is beautiful! Rebecca has chosen to alter her Coco so it is a more fitted silhouette, and the end result is stunning. We love that fabric, too! We've all gone a bit crazy over this one…Sarah created an elegant, sleeveless Coco dress, in this incredible dotty fabric, and just looks so chic. We are dying to recreate this, we wanna look like Audrey Hepburn, too! 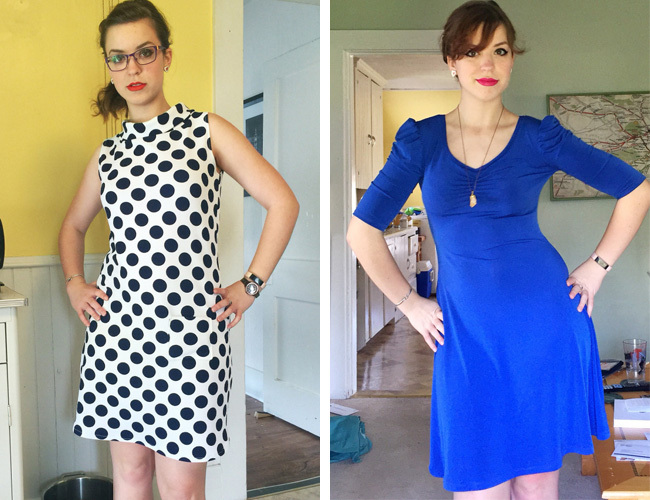 On the topic of beautiful dresses made by Sarah – we totally love this Agnes dress hack, too. 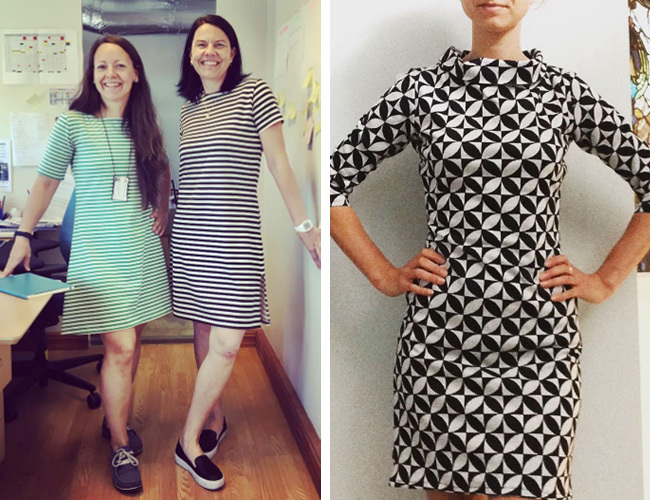 For those not familiar, Agnes is our jersey top sewing pattern, which Sarah has lengthened into a dress. The result is stunning! 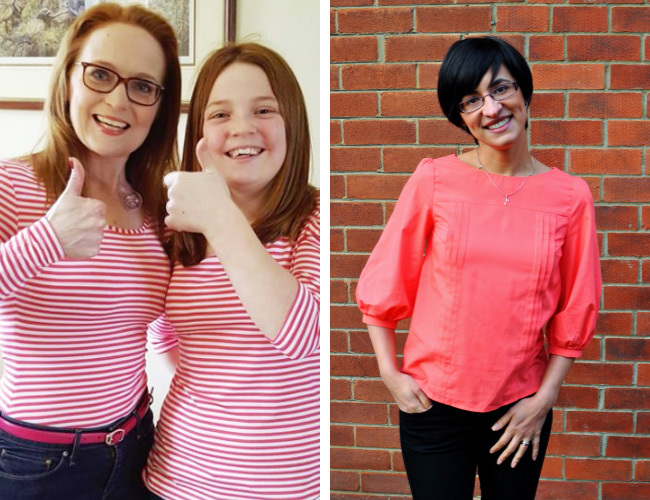 Tilly loves this photo - Jo made these amazing matching Agnes tops for herself and her niece, Emily – thumbs up to you, ladies! Patsy’s coral Mathilde blouse is so lovely. The material really lends itself to the front tucks of the pattern, creating a really clean look. This is one chic blouse! Sandee’s Miette skirt hack is just gorgeous. She has added a pinafore, and can we talk about that dotty fabric?! Perfection! Extra style points for that crab purse, too. Laura’s car print Miette skirt is bright and gorgeous – a great blank canvas for a quirky print. Catherine’s Martha dress looks amazing, the material really accentuates the flattering shape. Gorgeous! The Orla top is a feminine blouse, with optional snowdrop collar. Sandy’s version looks amazing, that collar is so neat! We really love how Emilie has used contrast binding for her Fifi pyjama top, it gives it a whole new look. @sewunco has created a beautiful, vibrant Fifi pyjama set in vivid florals, which looks fantastic. And last, but by no means least, let’s have a look at what you talented sewists have been making from our book, Love at First Stitch. I could probably write an entire blog post on all of the beautiful Megan dresses that you make. It is one of the most popular patterns in the book, and quite rightly so – it’s a shape that flatters most people, has clean lines, and is elegant. Linnéa demonstrates this perfectly here, and looks great her beautiful blue Megan dress. Marie’s Lilou dress really caught my eye – granted, it’s not a recent make, but I came across it recently and am slightly obsessed with it! The shape! The colour! The gently scalloped neckline! And, the material used to be a pair of curtains. How’s that for upcycling? 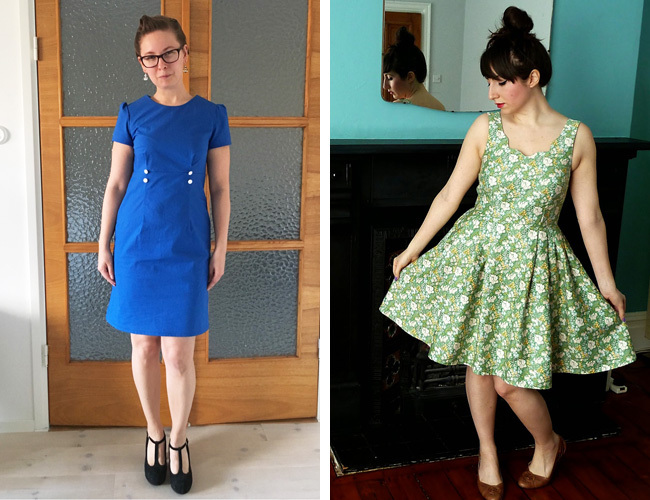 Well, that's it - a whistle stop tour of all of the gorgeous things you've been making with our sewing patterns. Be sure to tag us on Instagram using the hashtag for the pattern (eg. #SewingBettine, #SewingCoco, or #LoveAtFirstStitch if it's from the book)- or you can email me a pic of your makes. And for further inspiration, head to the Maker Gallery on Pinterest! I can't wait to see more of your makes!